By Leon Degrelle. 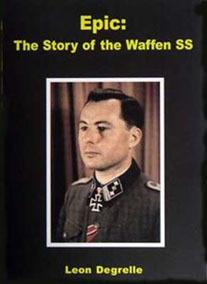 The story of the Waffen SS, as told by its general Leon Degrelle. The Waffen SS was the largest purely volunteer army in history, numbering more than one million men — with 600,000 of them being non-Germans. This remarkable pan-European force was under the command of the Belgian Degrelle, of whom Adolf Hitler once famously said that if he had a son, he should be like the Waffen-SS general. Degrelle explains in detail the background, organisation, fighting conditions and much more in this riveting discussion. P/B, 72pp, 37 black and white photos.